Home News GIANT RATS EAT CHILDREN! The Sun has reported that gigantic South African rats are being blamed for a series of predatory attacks on children, resulting in the tragic deaths of two infants. Eyewitnesses claim that the monster rodents are as big as cats — up to 3-feet in length including their tails — and are believed to have teeth over an inch long. These ferocious beasts are said to be responsible for numerous attacks on children in one of slums surrounding South Africa’s larger cities. The deaths appear to be part of a spate of deadly rat attacks in the country. 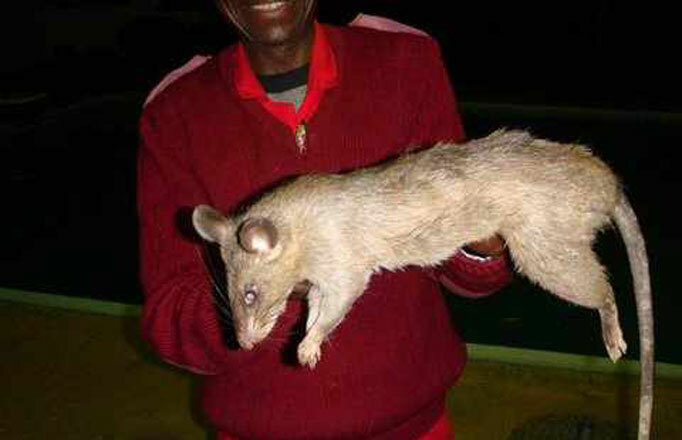 Last month, 77-year-old grandmother Nomathemba Joyi died after giant rats ate a portion of her face. While authorities are not sure what kind of creature is specifically responsible for these attacks, they have speculated that the killer rodents are likely African Giant Pouched Rats; a species of native to sub-Saharan Africa. These rats are huge, nocturnal, omnivorous — eating both plants and animals — and can produce up to 50 young a year. Next articleAMATEUR ASTRONOMER SPIES MARS BASE ON GOOGLE EARTH!